Some people are actually worshiping angels, which is expressly forbidden in the Holy Scriptures. LOL, the biggest misconception about angels is that they are beautiful women and chubby little babies with wings. If you will read what God tells us about real angels in His Word, you will see there is never any indication that there are female or baby angels, but rather powerful male warrior angels. They are very tall and very powerful. Before this world was created, the Bible tells us that satan, who himself was an angel, tried to take God's place in heaven and one half of the angels sided with him, and suffered the same fate as satan. 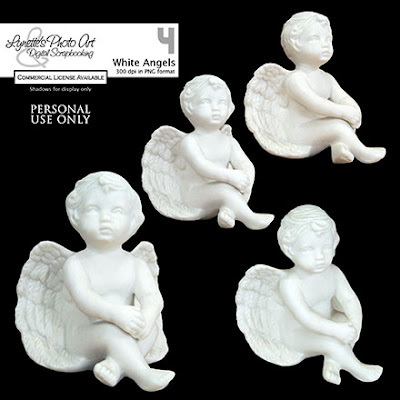 But we all love pretty pictures of lovely, graceful women angels and the cute chubby baby ones too, so, I have four sweet little white ones for you today. Hope you enjoy and maybe even learned a little about real angels! God bless you! Thank you! Your blog post will be advertised on the DigiFree Digital Scrapbooking Freebie search engine today (look for timestamp: 21 Feb [LA 07:00pm, NY 10:00pm] - 22 Feb [UK 03:00am, OZ 02:00pm] ). These angels are sooo very beautiful! THANK YOU so very much for your generosity. Thank you so much for this Freebie. I want to let you know that I posted a link to your blog in Creative Busy Hands Scrapbook Freebies Search List, under the Elements Only, Papers Only post on Feb. 22, 2009. Thanks again.